Sullins Connector Solutions’ new 1.0 mm header series when added to the existing 0.050″, 2.0mm and 0.100″ contact centres optimize design flexibility and manufacturing efficiencies. Sullins Connector Solutions now offer 1.0 mm (0.039″) contact centreline SMH Series Male Header, and SFM Series Female Header Mates. The addition of these board-to-board connector series to Sullins’ expanding header portfolio allows OEMs and assemblers to cut vendor count per bill of materials (BOM), as well as reduce overall costs and time-to-market. Parts are available in single and dual row configurations, with or without guideposts, and with SMT, straight, or right angle terminations. To further support design flexibility, male headers are provided in 1.0 mm or 1.5 mm profiles, and are offered with 1.65 mm or 1.90 mm head heights in SMT versions. Corresponding female header mates may be ordered with 2.1 mm or 3.15 mm profiles. Parts are compatible with reflow processes up to 260 degrees peak, and feature an extended temperature range of -40 degrees C to +125 degrees C. Materials are UL94V-0 rated. Sullins SBH Series fully shrouded male Box Headers, and SFH Series female Header Mates are engineered for board-to-board or board-to-cable connections. They significantly reduce the possibility of mismating, and help designers reduce the vendor count per bill of materials (BOM). 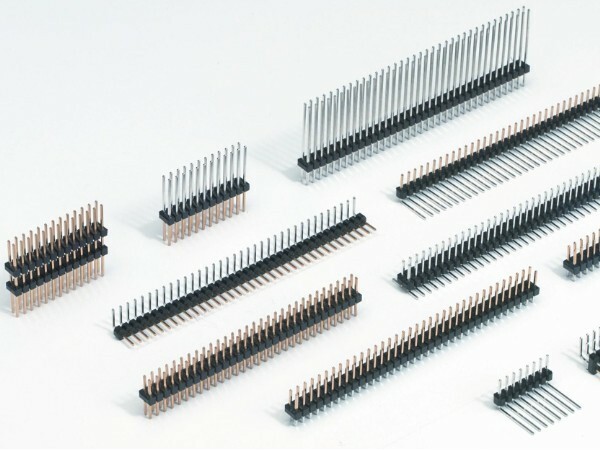 The dual-row SBH Series Box Headers are offered in 1.27mm x 1.27mm, 1.27mm x 2.54mm, versions, with either straight or right angle dip solder terminations. To further enhance OEM and assemblers design flexibility manufacturing efficiencies, parts are supplied in surface mount (SMT), insulation displacement (IDC), and plated through hole (PTH) styles. The SFH Series female mates are provided in corresponding contact positions with the box headers, and may be ordered with polarizing keys to ensure proper mating alignment. Additionally, an optional strain relief feature on IDC female mates minimizes tension on cable connectors to promote longer product life. These through-hole, space saving, sockets and headers are soldered to the PCB, providing support and durability for applications requiring multiple insertions and extractions. The new 1.0 mm centreline headers and female mates are engineered for use in an array of high-density applications in which board spacing and overall size and weight are factors. Ideal for use in general consumer, industrial, and commercial applications; parts are frequently specified for board-to-board connections in household appliances, testing, computer, process control, security systems and telecommunications equipment. They are also an excellent choice for connecting PCBs in HVAC equipment, fuel pumps, and vending machines. Sullins’ shrouded box headers have current ratings of 1 A to 3 A maximum per contact, and are available in 3 through 50 positions. Materials are UL94V-0 rated, and withstand reflow processes up to 260 degrees C peak. Headers are provided as standard with overall gold flash plated brass contacts, whereas mates are supplied with overall gold flash plated phosphor bronze contacts. Insulation materials are PBT or Nylon-6T, and insulation resistance is 1000 mega ohms. Operating temperature range of the parts is -40 degrees C to +105 degrees C.
Sullins hi-temp Headers and Jumpers are optimized for 150 – 250ºC continuous operating temperatures and are initially available in single and dual row versions for .100″ pitch. Applications include: burn-in oven testing, design stage component testing and evaluation, and any thermally demanding application.